The Oklahoma bombing and the first World Trade Center bombing provide grim reminders of the horrific damage domestic and foreign terrorists can cause with fertilizer based explosives. Recent salmonella outbreaks also reinforce how essential a pure food supply chain is to all of us. The Food, Conservation and Energy Act of 2008 created Section 450 of the IRC which provides a substantial new $100,000 Agricultural Chemicals security credit (Ag Tax Credit) per facility for the Fertilizer and Agricultural Chemical industry facilities. Recognizing that the Ag fertilizer and chemical industry is subject to an increasing number of legally mandated and recommended federal, state and local and security improvements, this new law provides a substantial tax credit to offset some of the economic costs of creating and improving new and improved security plans. The potential credit amount is 30% of qualified chemical security expenditures up to $100,000 per facility and up to $2,000,000 per year and a maximum $10,000,000 over 5 years. The Ag Tax Credit is available for expenditures occurring as of the May 22nd, 2008 date the legislation was created. Section 450 defines an eligible agricultural business to include sellers of fertilizer and Ag chemical to farmers and ranchers and those that manufacture, formulate, distribute or aerially apply fertilizer and/or Ag chemicals. (9)Other measures provided for by regulation. The four main categories of fertilizer and agricultural chemical facilities encompassed by this legislation all have distinct security challenges. Large chemical plants are complex facilities typically located in heavy industrial areas close to waterways and railways. Distribution facilities involve tank farms and tanker truck off loading and on loading. Retail facilities serving the commercial farm and ranch industries are normally located in open rural areas. Crop duster airfields have a large perimeter with limited on site human security resources. In order to best use this credit, Ag fertilizer and chemical facility operators need to integrate facility security expertise with facilities’ tax experts who understand facility security plans and know how to apply the tax law and calculate the proper tax credit. Ag Tax Credit service providers have developed software that tracks existing, qualifying, security measures, integrates the qualifying Ag security credit measures and creates the resulting required Ag chemical security plan. The nature of the required security plan and the eligible qualified chemical security expenditures should be very familiar to those used in creating the required written security plans for C-TPAT (Custom-Trade Partnership Against Terrorism) customs clearance, since they are essentially the same. Qualifying Ag chemical taxpayers, who are also importers, should give strong consideration to designing and using the enhanced written Ag Tax Credit plan to obtain expedited customs clearance. As a first step, the Ag chemical facility should identify all the existing security measures that fall into the enumerated security categories. It is crucial to identify all of the existing and ongoing credit measures since the 30% credit is based on the annual combined existing and proposed new measures. For example, a large chemical facility may already have major commitments for employee verification software that integrates into its enterprise and HR system. Those facilities, that already have preliminary security plans on file with CTPAT or with other government federal and government agencies, should use the existing plans as a tax credit road map. The next step is to conduct a security vulnerability assessment to identify measures needed. Certain facilities that fit higher risk profiles, are required to complete top-screen-risk profiles, and may be obligated to provide the Department of Homeland Security with Vulnerability and Site Security Plans. In these situations, the Vulnerability Plan presents the actual facility vulnerabilities, and the Security Plan is expected to address those vulnerabilities. Accordingly, in these situations, the Vulnerability Plan is actually an excellent tax planning tool, since presumably; the organization will be making the expenditures necessary to address weaknesses. (Note: For security reasons, the security officer may not be able to give the tax adviser complete access to the security plan but should be able to summarize the expenditures necessary to become compliant for tax evaluation). 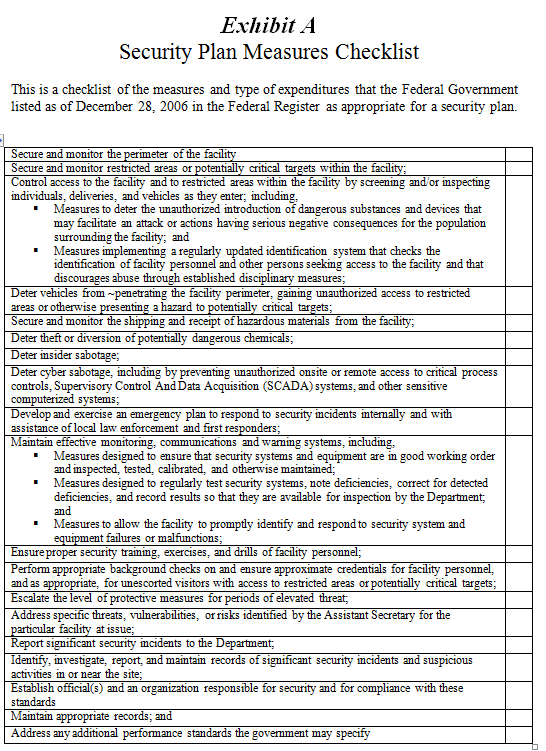 On Thursday, December 28th, 2006 in Part II of the Federal Register, the Department of Homeland Security indicated that for higher risk facilities, the security plan should address the checklist items described in Exhibit A (attached). Although many fertilizer an Ag chemical facilities already have perimeter fencing, there are many intrusion and access enhancements that can improve security. Certain security technologies such as access security, intrusion security, infrared security cameras and chemical sensors have greatly improved in recent years, and are likely expenditure candidates for this new tax credit. The Ag Security Tax specifically includes security cameras in the eligible expenditure category. Because all objects generate heat, infrared thermal cameras operate as well at night as they do during the day. Major improvements in infrared technology are spurring a widespread introduction of infrared camera-based-security systems for both security perimeter protection and leak detection. Infrared cameras are particularly well suited for large perimeter applications because thermal energy penetrates through smoke, dust, modest foliage and light fog. Thermal images can discern the characteristics of an environment that is not normally apparent, such as open windows or recently parked vehicles. Although there are multiple providers of infrared cameras, Flir Systems is by far the industry leader. Other manufacturers include Raytheon, L-3 Communications and Axsys Technologies. Using the Flir systems network and connectivity options as a tax example, we can analyze how Ag tax credit can be used as economic support for a multi-component investment in a comprehensive security system. The Flir infrared camera system can be integrated with Nexus middleware software to provide video analytics utilizing thermal and multi-sensor cameras. Basic sensors can be configured with a variety of optional sensors including digital magnetic (DMC), laser rangefinder (LRF) and ground positioning systems (GPS) that provide precise threat geo-location information. (A)For complex facilities, taxpayers need to know how to identify separate facilities that are eligible for the $100,000 credit. At this time, it is unclear whether the approach is going to be similar to that of the ASHRAE (American Society of Heating Refrigeration Engineering) building definitions used for EPAct (Energy Policy Act), or another methodology. (B)Security measures within a building envelope (meaning within the perimeter of the building) for security lighting, including related interior light sensors and lighting controls, should be separated from exterior and non-building security expenditures since they may be eligible for other federal tax incentives under EPAct. (C)Lastly, in multi-business division facilities expenditures need to be allocated between those that relate to the handling of Ag chemicals and are Ag Security Tax Credit eligible from those that are not. Presume a fertilizer or Ag chemical facility operator invests $100,000 in an infrared security system and has no other eligible expense for the year. Presume that before investing in the same camera system, the same operator had already invested $100,000 in eligible perimeter fencing and other security measures in the same tax year. Please note that tax credits are more valuable than tax deductions. Using the 40% combined federal and state tax rate, the $30,000 EPAct tax deduction is worth $12,000. Note, however, that the energy efficient lighting investment has an important added economic benefit in that it will result in a perpetual savings in lighting electrical costs worth thousands per year. The unquestioned need for added security in the Ag chemical industry is going to drive tremendous investment in Ag chemical facilities security equipment. Many companies will use the new opportunity to improve security and meet current and anticipated regulatory requirements. Ancillary benefits from an improved security plan should be reduced theft, reduced vandalism and the benefits of reduced risk profile. Our prediction is that as this program takes hold and Ag chemical facility security measures markedly increase, that regulatory authorities are going to raise the bar on minimum security compliance expectations. This means that the earlier the Ag chemical facilities act to improve security, the better and more enhanced security is going to be a continuously improving activity. About Energy Tax Savers, Inc.
Energy Tax Savers, Inc. is an interdisciplinary tax and engineering firm that specializes in the energy efficient aspects of buildings and Ag Tax Credits. Charles Goulding, an attorney and certified public accountant, is President of Energy Tax Savers, Inc.
Jacob Goldman is a chemical engineer and tax consultant with Energy Tax Savers, Inc.
Taylor Goulding is an analyst with Energy Tax Savers, Inc.